World dye and organic pigment demand will rise 6.0 percent yearly to $19.5 billion in 2019. The Asia/Pacific market will remain dominant and will grow the fastest. The smaller organic pigments segment will outpace dyes due to increased use of high performance pigments in paints and coatings and plastics applications. 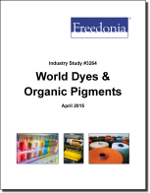 This study analyzes the $14.5 billion world dye and organic pigment industry. It presents historical demand data for 2004, 2009 and 2014, and forecasts for 2019 and 2024 by product (e.g., disperse dyes, reactive dyes, acid dyes, direct dyes, basic dyes, azo pigments, phthalocyanine pigments), market (e.g., textiles, printing inks, plastics, paint and coatings), world region, and for 19 countries. The study also considers market environment factors, details industry structure, evaluates company market share, and profiles 35 industry players, including BASF, Clariant International, and Huntsman.